Sentaro Iwata was born in Kurofune-town, Asakusa, in Tokyo. Sentaro began to be taught under an illustrator in Kyoto after He graduated from an elementary school, and he had studied methods of Japanese paints at the same time. Sentaro backed to Tokyo when he was 18, and he looked for work with tentative illustration jobs like making illustrations of prints or painting on toys. On 1920, he debuted as a book illustrator from entertainment magazines, and he warned money for daily life. After that, he began to study under Shinsui Itou. 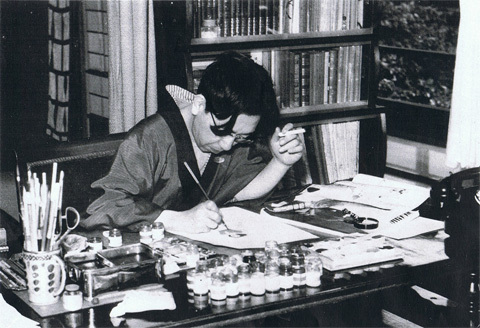 He had fascinated people for more than 50 years as one of a pioneer of book illustrators acted in Showa era, and he took the world of painting by storm; his works are always appeared in famous entertainment literature such as "Naruto Hicho" by Eiji Yoshikawa (1892-1962) and "Hebi Hime Sama (Princess Snake)" by Matsutaro Kawaguchi (1899-1985), newspapers, and various kinds of novels. On 1954, Sentaro was conferred the Kikuchi Hiroshi Award, and on 1961, he decorated the Sizyu-housyou Award. Sentaro passed away on 1974 caused by cerebral hemorrhage at 73 in Keio hospital, Shinanomachi, in Tokyo.